I can’t remember which came first, but this is basically the pistol version of the L.A.E.R. from Fallout New Vegas. 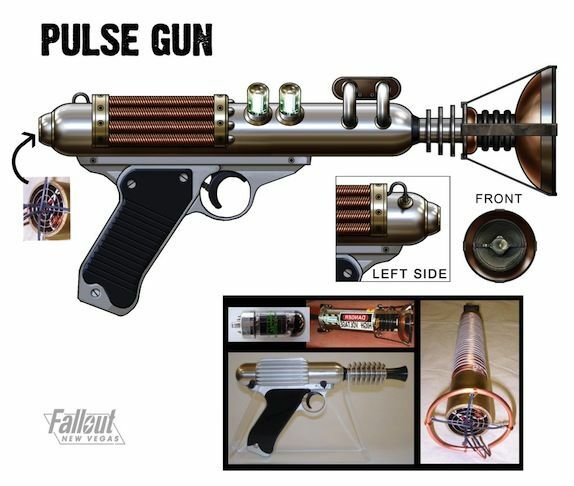 Josh Sawyer provided me with a couple of photos (shown in the image) of the type of pistol he was looking for, so I basically “frankensteined” all of those elements together. I don’t normally conceptualize weapons, so I felt a bit uncomfortable doing them on FNV, partly because Fallout fans are very particular, but mostly because I don’t draw weapons much. I was the only concept artist on the team though, so I had to do the best I could. Head over there for more musings - and more art - by Brian Menze.